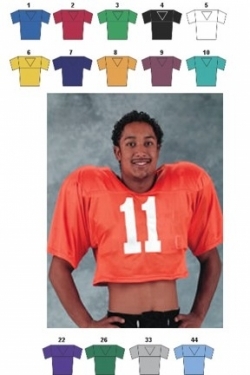 Double Shoulder/Yoke Full Cut Sleeves Shimmel Length Sewn With Core-Fiber Thread Reinforced Construction Not Recommended For Full Contact (Tackle Football). Same Product for Youth is 2311. Jersey comes with logo on front and numbers on back. Minimum order of 6.